Granular algaecide safe for use with Trout, Koi, & Catfish. GreenClean® is a granular algaecide excellent for smaller ponds in the presence of Trout, Koi, & Catfish. GreenClean® is fast acting and completely safe. 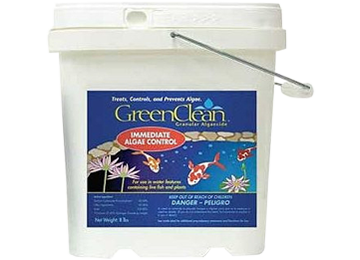 GreenClean® aquatic algaecide is a natural algae killing product that will work in ponds and lakes with Trout, Koi, and catfish. Apply GreenClean® with a spreader or by hand with a scoop. GreenClean® Granular works through oxidation, breaking down algae cells on contact. Its organic chemistry immediately begins fighting algae blooms, releasing vital oxygen into the water body as it biodegrades. GreenClean® Granular is ideal for algae including string algae. For a more complete solution, we recommend using other pond weed control products to give your pond the healthy and beautiful look it was was intended to have. Manufactured by BioSafe Systems, LLC. Been using this product for 4 years. Have a lot of koi in a 1800 sq.ft. earthen pond. I am very pleased with this algaecide because it works well and doesn't kill our fish. Thank you Lake Restoration for carrying this product. I would advice anyone to give it a try.